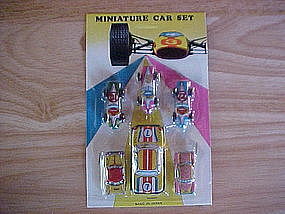 Miniature racing car set mint on original card display. Six (6) Tin litho cars which include 3 dragsters and 3 stock cars. The 3 dragsters and the 2 small stock cars are about 1 1/2" each and 1 larger stock car measuring over 2". The 3 stock cars have "Japan" or " made in Japan" lithographed on each. Also the original display card has MADE IN JAPAN printed on it. 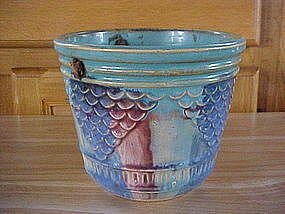 Beautiful 1920's HULL POTTERY Hanging Basket. Multi Colored fish scale design. It is signed in the bottom, " 25, H in a cirle, 5 1/2." It is 4 1/2" tall and the diameter is 5 3/8". It has a hairline on two sides but still beautiful. 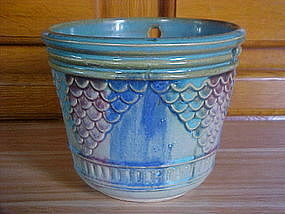 Beautiful 1920's HULL POTTERY HANGING BASKET. Multi colored fish scale design. It is signed in the bottom " 25, H in a circle, 5 1/2." It is 4 1/2" tall and the diameter is 5 3/8". It is in wonderful shape!!! Perfume bottle made by " FENTON GLASS CO." from 1938-39. With its glass stopper it is 6 1/2" tall, with out the stopper it measures 5" tall. 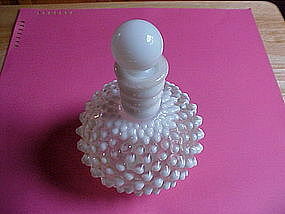 It is in mint condition and is of the HOBNAIL pattern. This bottle also maintains its original label on base that says, " Hobnail pastel Cologne Wrisley, New York, Chicago, APPLE BLOSSOM, Content 9 fl. 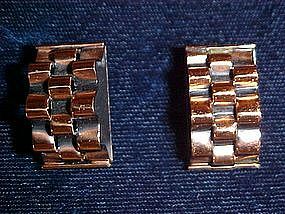 oz., Made in U.S.A."
Super pair of signed " Renoir " copper earrings in the basket weave pattern. 1950's era in beautiful condition! Each earring measures 1" long. 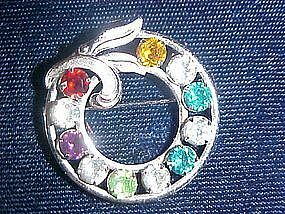 Vintage multi color rhinestone Sterling silver pin signed " Van Dell Sterling." This pin is 1 1/4" in diameter. Although a smaller pin, it is a real eye catcher with it's large multi color rhinestone scheme. Van Dell corporation was founded in Providence, R.I. in 1943. This company is known for it's high quality costume jewelry. 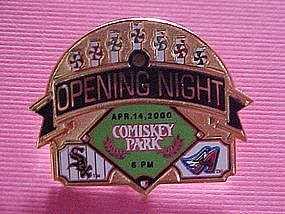 Original issue pin commemorating the Opening night of the new Comiskey Park on April 14, 2000. This enamel pin also has the White Sox and Anaheim Angels Logos. The pin is in excellent condition and measures 1" high X 1 3/8" wide. The White Sox beat the Angels that night with the score of 9-4. A few years later the new Comiskey Park was renamed U.S. Cellular Field. Vintage stewardess wings from Northwest Airlines. Vintage 1950's. 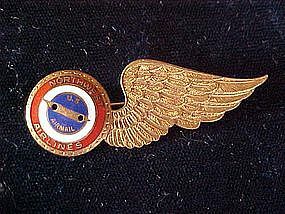 Features an enameled disc that says, " Northwest Airlines U.S. Airmail," and attached extended wing and measures 2 1/8" in length and in very fine condition. Fabulous 1950's clip on earrings signed by " MARVELLA." 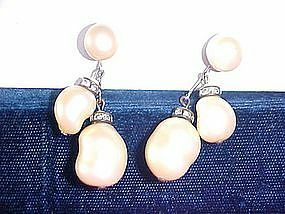 This pair of earrings feature large faux mobe pearls and discs with embedded rhinestones. They measure 1 1/2" each in length and are in Fine condition. In 1948, Marvella pears were advertised as " the loveliest pearls made by man!!" And ladies, Pearls are Back Big this Year!!! Original 1960's tin Pop Pop boat. Mint in Box!!! This boat measures a little over 5" long. It has beautiful lithographics and it comes with all original equipment including candles to make it work.It aslo has applied sticker with instructions written in German because this toy was destined for the German Market. 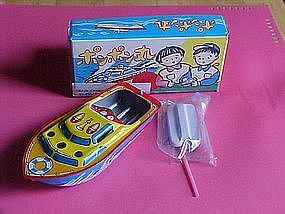 This toy was made in Japan and it is printed made in Japan on the stern behind the keel. Exceptional 1930's Vintage extra large Rhinestone Brooch. This piece looks like it was borrowed from the Tower of London's crown jewels Collection!!! This pin measures over 3" in diameter and features a multi jeweled cross sorrounded by many rhinestones, all hand set!!! 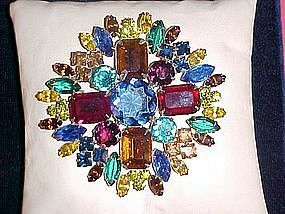 This pin is filled to the brim with multicolored rhinestones, Magnificent!!! If you want to be noticed then this is the pin for you, but I caution that it might even be too dangerous to wear!!! 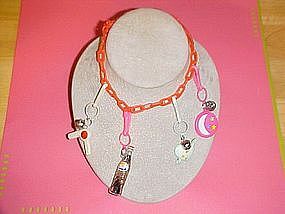 Cool 1960's plastic Mod Design necklace with four charms. Charms include; plastic hair dryer with bell, pepsi-cola crown top bottle, mod heart with arrow and hot pink smiling face. This vintage necklace measures 23" long. It is in great condition!!! 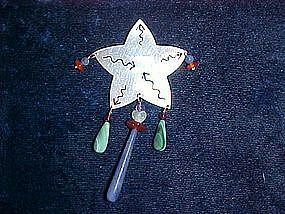 Beautiful Native American crafted pin featuring sterling silver star with five points, each with cut out flowing arrows with attached simi precious stones. Some of the simi precious stone beads are malachite, amethyst and lapis. It is signed on back " SPIRIT OF TWO, 1989, 925." The star itself 1 3/4" long and the total pin measures 3 3/8" long. 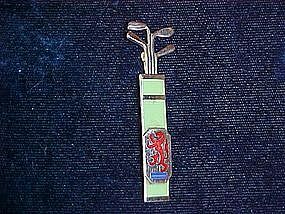 This wonderful pin is in mint condition!! 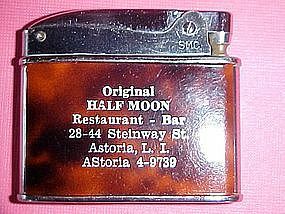 Art deco style 1950's cigarette lighter advertising the " Original Half Moon Restaurant-Bar that was on Steinway St., Astoria L.I. NY." This lighter is in very good working order and was made by Supreme lighter company. 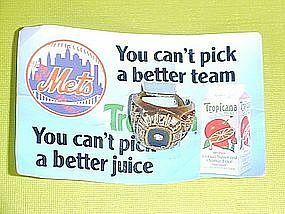 New York Mets World Series ring repleca issued by Tropicana Orange Juice in 1986. This is a nice piece of Baseball Memorabilia. The ring is in Mint Condition and one size fits all. A Must for the Mets Fan!!! Five are available. 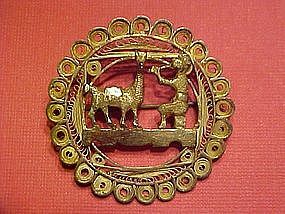 Hand crafted pin made by Native Indian craftsmen of Peru. This sterling silver pin features a filigree wreath sorrounding a Native Indian playing a flute to a Llama. 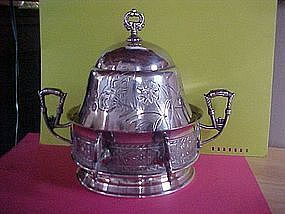 It is marked 925 on the back and measures 1 5/8" in diameter and it is in very fine condition.